The most anticipated season in UB Football history starts Saturday with home game against FCS Delaware State. The schedule determines the wins, which will or won’t meet the expectations. There are no Top 25 opponents, only one game against a Power 5 opponent, and only two of the four non-conference games are against teams that went to bowl games last season. If the powerful Buffalo offense, led by QB Tyree Jackson & WR Anthony Johnson, can pile up points then this season could be magical. Maybe more magical than anyone is expecting. Punter Fidel Romo-Martinez Avg 44.8 yards, he had 24 kicks over 50 yards and 17 inside the 20. Notes: Delaware St is 5-40 the last four years. Last year they lost 77-6 at Florida State. Milstead is a former All-American who played five years in the NFL for five teams from 1992-2000. RB duo of Brycen Allen and Mike Waters will make a solid group in the MEAC conference. Players to Watch: QB Frank Nutile 12TD’s and 1,500 yards led team to wins in four of last five games. Defense led by safety Delvon Randall 80 tackles and 4 int’s. Notes: Temple has been bowl eligible four straight years. WR Isiah Wright is very versatile, he scored touchdowns five different ways. Owls return 6 starters on offense and defense. Phil Steele picks them second in the AAC East. Players to Watch: DE Maxx Crosby and DE Jeremiah Harris, the two men combined for 17 sacks last year and give EMU the best DE duo in the conference. Notes: Team must replace second best passer in team history in Brogan Roback. This could be the best defense the Bulls face all year. EMU has a veteran offensive line led by Jimmy Leatiola. EMU has only been to two bowls in their history in 1987 and in 2016. Picked 4th in the MAC West. Notes: Ash is known as a good defensive coordinator. Before being a head coach he was DC at Wisconsin and Ohio State. Rutgers is predicted to be the worst team in the Big 10. Last year they were out gained by 210 yards a game in Big 10 games. 15 starters return from last year’s team. Last year Eastern Michigan defeated Rutgers 16-13. Players to Watch: RB Darnell Woolfolk over 1400 yards and 23 TD’s the last two years. SR LB James Nachtigal leads the defense and had 103 tackles as a first year starter in ’17. Notes: UB should have won last year in West Point. This year they get Army coming off a trip to Oklahoma the week before. After it seems never being able to beat Navy, Army has now beaten the Midshipmen two years in row. Army must replace QB Ahmad Bradshaw who started 25 of the last 26 games; winning 18 of those games. Players To Watch: RB Jonathan Ward returns and he was the MAC’s third leading rusher last year. Notes: CMU went from QB Cooper Rush to Shane Morris last year. Morris didn’t miss a beat but now he has graduated. CMU returns only four starters on offense and only 10 starters overall. Many predicting a step back this year for the team as they have been picked 5th in the MAC West after going to four straight bowl games. Players to Watch: LB Ulysees Gilbert- he’s been the teams defensive MVP the last two years. Gilbert is now a senior and led the team last year with 141 tackles. WR Kwadarrius Smith- Akron’s top scorer returns. He’s a game breaker who ranked 9th nationally with 21 yards per reception in ’17. Notes: Akron returns only five starters on offense and must replace QB Thomas Woodson. Woodson ended his career second all-time in yards passing for the Zips. Strange stat: The Zips were 7-0 last year in games they led at half and 0-7 in games they trailed at half. Team is predicted to finish 4th in the MAC east. Players to Watch: A trio of WR’s in Cody Thompson, Dionte Johnson (1st team all MAC), and Jon’Vea Johnson (82 recptions 15 TD’s the last 2 years). Safety Kahlil Robinson leads the defense. Robinson had 67 tackles last year. Notes: This team must replace their QB Logan Woodside and three starters on the defensive line. The Rockets have one of their biggest games at home this year as Miami of Florida will visit the Glass Bowl on September 15th. Toledo is picked second in the MAC West. Toledo is tough at home. Last year they were 6-0 and they are 30-6 over the last six years at home. Players to Watch: QB Gus Ragland accounted for 22 TD’s last year in 9 games. WR James Gardner their leading WR is back LY he had 927 yards and 11 TD’s. Notes: Redhawks play a good non-conference schedule. They play Marshall, Cincinnati, Minnesota and Army non-conference. Predicted 3rd in MAC East. Team returns 16 starters. Martin, a Brian Kelly disciple is only 16-33 in his first four years In Oxford. Players to Watch: RB Justin Rankin: he was the team’s leading rusher and receiver the last two years. LB Jim Jones made 151 tackles and 11 for loss last year. Notes: Lewis comes over from Syracuse and is a Dino Babers clone. He loves to run a very fast paced offense. Last year Syracuse led the nation with 87 plays per game. Look for Kent to take some lumps early as they play at Illinois, at Penn State and at Mississippi in three of the first four weeks. Players to Watch: QB Nathan Rourke- had five 100 plus rushing yard games and set a school record with 21 rushing TD’s. RB AJ Ouellette had four 100-yard rushing games last year. 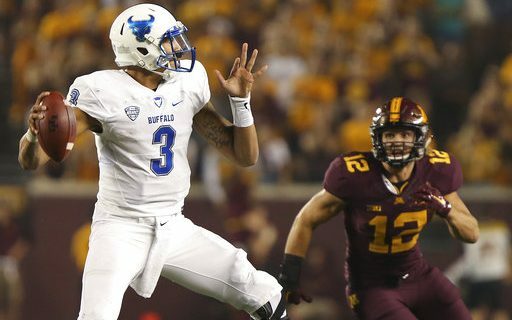 Notes: UB won a huge game 31-24 last year in the season finale to become bowl eligible. The offense comes back loaded but the defense lost several key starters. Quentin Poling and Chad Moore were very good defensive players that the Bobcats must replace. Ohio returns only 4 starters on defense. This game could decide the MAC East. Players To Watch: WR Scott Miller has 1690 receiving yards the last two years. RB Andrew Clair as a freshman had four straight 100 plus yard games in ’17. Notes: Mike Jinks needs to win now after posting a 6-18 record his first two years at BG. Jinks brought in veteran defensive coordinator Carl Pelini to help his defense. Pelini (brother of Bo) was defensive coordinator for his brother at Nebraska from 2008-2011. UB snapped a 6 game losing streak last year by beating the Falcons by 10 in UB stadium. This is the only time in my life that I can say that 12-0 is on the table for this year’s Bulls team. The Bulls will have the best QB and the best WR every time they take the field. The Bulls have a few tough road games at Toledo and at Ohio in conference. I predict a 9-3 season for the Bulls this year. How are the Bulls dealing with these expectations? By not talking about them.